The Huron 3 is a speaker that we’ve really needed for years. It combines unusually high efficiency with a very easy impedance load, good bass extension and low colouration. The result is a big, enveloping sound, with excellent dynamics, speed and clarity. The sensitivity of over 95dB/1 watt means that any quality amplifier can be used, almost regardless of power - in fact anti sociable volume levels are possible with just 7 watts from a 300B single ended amplifier, if desired. Despite this incredible efficiency the sound does not lack detail or refinement. - a common side effect of other similarly efficient designs. The impedance is high as well, averaging over 8 ohms, so it draws very little current from the amplifier (most other high sensitivity speakers on the market are closer to 4 ohms, which gives them an extra 3 dB of sensitivity on paper - as they are effectively drawing twice the power from the amplifier - so don’t forget to factor this end when comparing specifications) . The large drive unit surface area and the waveguide (horn) loaded soft dome tweeter don’t just aid efficiency, they also lower distortion and make for a very effortless and fast sound. The cabinet is unusually deep, but as it has been designed to be positioned close to walls it actually takes up no more space than other similarly priced floorstanding speakers, and the extra cabinet volume allows well extended low frequencies. The wide dispersion means that positioning is very easy and there’s no small sweet spot to worry about. What this all adds up to is a speaker that is simply great fun to listen to, it pulls you right into the recording and gets your foot tapping. Finish: Cherry or Walnut real wood veneer. Satin Black or Satin White paint. High Gloss Black or White paint for a premium. The Direkt is a design that will probably polarise opinion on its looks alone. It’s unashamedly retro, it’s a reclined, shallow, wide fronted box, exactly the sort of thing that is becoming fashionable once more, and for good reason too. Narrow cabinet designs can give neat precise imaging, but they tend to struggle to portray scale, and apart from those manufacturers who put drive units on the side, or use a large number of smaller drivers, the radiating area is somewhat restricted, hampering dynamics and raising distortion. With the Direkt a large 11” paper coned drive unit covers the bass and mid range which crosses over to a shallow horn loaded, large diameter soft dome tweeter at just over 2.3kHz. The result is an impressive 95dB sensitivity and an easy impedance, making them suitable for all sorts of quality amplifiers, almost regardless of power (they certainly thrive on the 7 watts of a 300B amplifier). The lower frequencies are nicely extended, with an effortlessness throughout that comes with good efficiency. The mids are smooth and big - not in terms of loudness, but scale and substance, a trait often evident with wide baffled speakers, yet there’s none of the presence lift found in certain makes of speakers that are desperate to impress with hyped detail. That’s a good thing as it means these speakers are forgiving of both systems and recording quality, and ultimately that makes them a very easy speaker to listen to for extended periods. Two finishes are available, high gloss black and high gloss white, both with stylish ‘racing stripes’ reducing the visual impact of their width. The fit and finish deserves special mention, they really are quite exceptional at this price level, even down to the quality of the chunky metal feet which really need to be handled to appreciate the quality on offer here. The Red 120 is a compact floor standing speaker with a big sound. 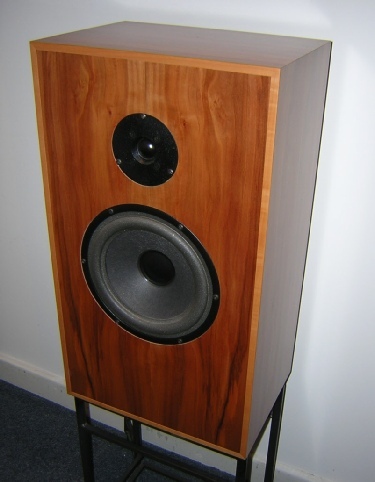 It looks like an elongated version of the Red 50, and uses two of the same bass drivers in an undamped multi chambered cabinet (as found in all Russell K speakers). I was impressed at how similar it sounded to the somewhat bulkier Red 100, the same strengths are there (I wont repeat them here, it has a lot of them! 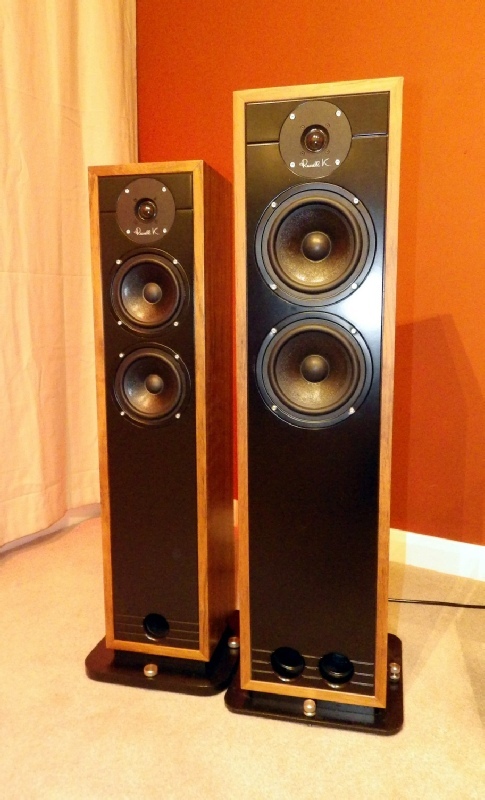 ), on top there’s a touch more richness to the sound and more extended lower frequencies. 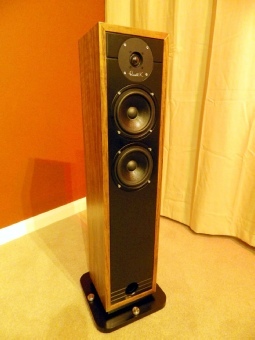 So what we have here is a very neat and unobtrusive floorstanding speaker that doesn’t trade sound quality for it’s compact dimensions and doesn’t dominate smaller rooms (sonically or aesthetically). 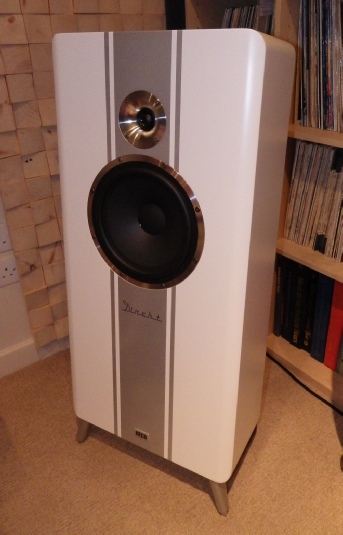 What’s more they’re very easy to place in a room and easy to drive - both characteristics that all The Russell K speakers share. They’re not limited to smaller rooms either, being remarkably room filling in larger spaces too. So highly recommended - regardless of whether you require a discreet floor standing speaker or simply want one of the very best sounding speakers in its price bracket. Dimensions: Height 91cm inc plinth, Width 20cm, Depth 19cm. 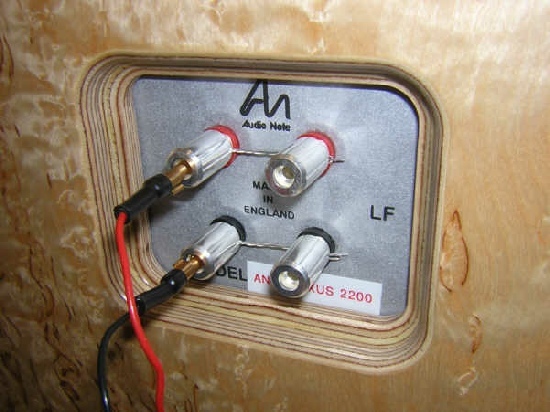 The AN-J is the middle model in Audio Notes classic range of speakers. It is a rear ported design that likes to be used very close to a rear wall and even across the rooms corners. Several different versions are available, with upgraded drive units, crossover components and wiring as you go through the range, I’ve detailed these below. 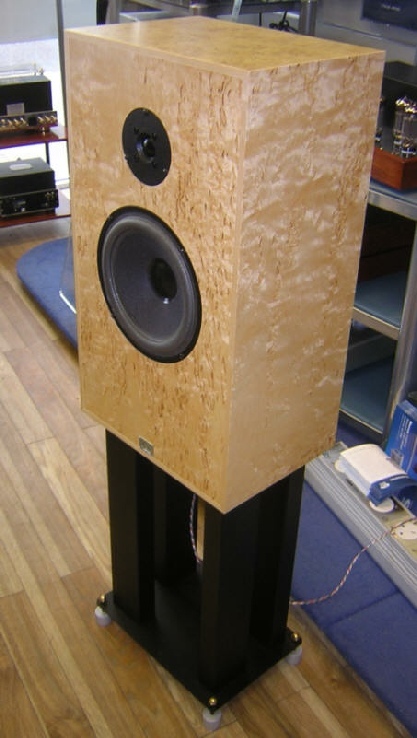 The pair shown here are the entry level version, the AN-J/LX, and are finished in Birch Burl. 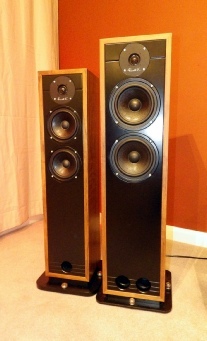 Their sound is immediate and dynamic (as you’d expect of a speaker with a claimed 93dB efficiency) with very natural tonality and remarkable bass extension for their size. The speakers are now also available with blue coloured Hemp cones as well as the grey Paper bass/mid cones for an extra cost. 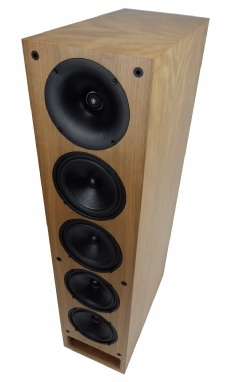 The Hemp has an effortless sound, with lower colouration and greater midband resolution. Please see the section on the AN-E HE model elsewhere for a description of what I feel is special about this driver. The cabinets are made from solid Plywood (except the AN-J/D Versions) and are available in a huge range of exceptionally high quality veneers. 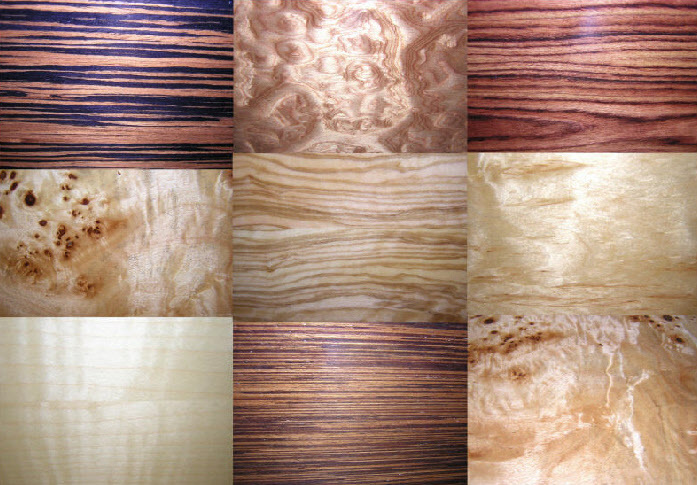 The options available are: Maple, Curly Maple, Palisander, Olive, Tulip, Alder, Oak, Apple, Cherry, Walnut, Black ash, Wenge, Birch Burl, Birds Eye Maple, Makassar-Ebony, Madrone burl, Indian Rosewood, Poplar Burl and Yew. I’ve pictured a few of the finishes below, we have samples of these finishes viewable in store too. The veneers are all available in either satin finish (standard), high gloss or Piano gloss. A choice of stands are available including Audio Notes own design (a flat back stand that requires mass loading) and the fully welded skeletal Something Solid XF (please see speaker stands section) are suitable. -AN-J Stands: Self assembly steel stands designed to be mass loaded with shot or sand: £POA at manufacturers request.